Traditional uses: Wood for net hoops. Shoots and seedlings can be collected and eaten fresh or cooked like asparagus. The samara seeds can be boiled and eaten, but it is usually only done so in an emergency. The sap can also provide some sweet nutrition. 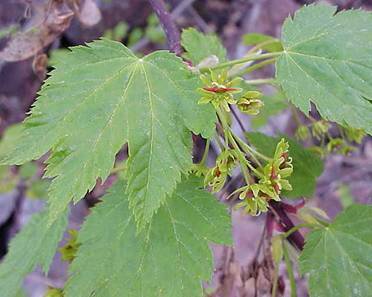 Douglas maple is said to be useful in curing nausea. The wood and bark are combined with twigs of Saskatoon (Amelanchier species) and made into a solution that purportedly improves the healing process of a woman following childbirth. The concoction has also been used to increase lactation. The light brown wood was carved into snowshoe frames, ceremonial pieces, drum hoops, and bows. The inner bark of the tree creates a tough fiber that was gathered and worked into mats and ropes. Local occurrence: Douglas maple extends from Alaska through British Columbia and Alberta, proceeds down to New Mexico and southern California. 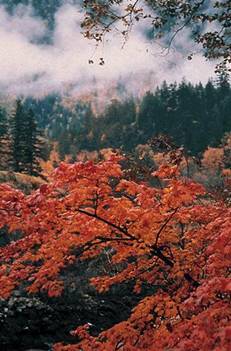 Habitat preferences: moist, well-drained soils of mountain slopes and canyons. This species is quite variable and populates the understories of coniferous and hardwood forests, dry ridges, forest edges, floodplains and uplands from mid to high elevations. Collection restrictions or guidelines: Fruit seed period begins in summer ends in fall. Seed germination: Cold Stratification Required. Propagation recommendations; Plant bare root ,container. Soil or medium requirements: Course to medium textured soils. Ph minimum 5.5 maximum 7.5. Installation form: Bareroot, container, seed. Recommended planting density: 700-2700 per acre. Care requirements after installed: Moist soil. Shade tolerant.